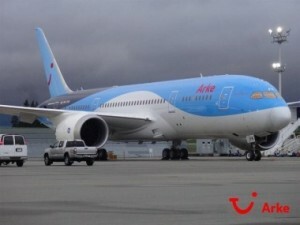 AMSTERDAM – Travel Company Arke Fly brings the first Dreamliner to the Netherlands. The Boeing 787 landed today at 12.30 (Dutch time) on the East Course at Schiphol Airport. The new aircraft is lighter, more economical and more comfortable than the current generation of passenger aircraft. The device also makes less noise. The first commercial flight of the Dreamliner is scheduled for June 8 in Antalya, Turkey. On June 12, the aircraft makes its first intercontinental flight to Curacao and Bonaire.